Yellow fever (YF) is a viral disease transmitted by mosquitoes causing a spectrum of disease from mild to severe symptoms. Mosquito bite avoidance and yellow fever vaccination is recommended for travellers visiting countries where there is a risk of YF virus transmission. Under the International Health Regulations (2005), an International Certificate of Vaccination or Prophylaxis for YF may be an entry requirement for some travellers to YF risk countries. YF certificate requirements are not necessarily connected to the risk of disease for a traveller. The YF vaccine is available at designated UK Yellow Fever Vaccination Centres (YFVC). There is no treatment for YF disease. Care of an infected person is based on managing the symptoms. Yellow fever (YF) is caused by a virus of the Flaviviridae family, which circulates between infected monkeys or humans and mosquitoes. YF virus can cause an illness that results in jaundice (yellowing of the skin and eyes) and bleeding with severe damage to the major organs (e.g. liver, kidneys and heart). The mortality rate is high in those who develop severe disease. YF is a vaccine preventable disease. In order to prevent the international spread of YF, under the International Health Regulations (IHR) (2005) , countries may require proof of vaccination, recorded in an International Certificate of Vaccination or Prophylaxis (ICVP). A Medical Letter of Exemption from vaccination which should be taken into consideration by a receiving country can be provided where a health professional advises that an individual should not be vaccinated on medical grounds. There is a risk of YF transmission in parts of the tropical and sub-tropical regions of Africa and South and Central America and in Trinidad (Caribbean). Areas with a ‘risk of YF transmission’ (also known as endemic areas) are countries (or areas within countries) where mosquito species known to transmit the disease are present and where the infection is reported in monkeys and/or humans. Some areas are designated as ‘low’ risk; these are bordering endemic areas where there have been no confirmed reports of yellow fever in either monkeys or humans. Evidence of transmission in the past is uncertain or suggests low prevalence of infection. Transmission of YF virus in these areas is therefore considered unlikely . Under-reporting, limitations in surveillance methods and misdiagnosis make estimating the burden of YF disease challenging . The World Health Organization (WHO) estimates 200,000 cases of YF and 30,000 deaths occur globally each year with the majority (90 percent) occurring in Africa. These estimates are based on studies from the early 1990s . However, a recent study of YF disease burden in Africa estimated there to be 130,000 (95% CI 51-380,000) cases of severe YF in 2013, resulting in 78,000 (95% CI 19-180,000) deaths . Following a consultation on YF and international travel, convened by the WHO in 2008, an expert working group considered the evidence for risk of YF transmission on a country by country basis [2, 5]. The results from this were used to develop vaccination recommendation maps that were first published in April 2011. The maps have been updated on occasions since this time to reflect up to date disease surveillance data. Maps developed by the US Centers for Disease Control and Prevention (CDC) shown below, align with recommendations published by the World Health Organization (WHO). Please note: due to a YF outbreak during 2017-8 the risk areas and vaccine recommendations in Brazil have been extended. See the Brazil Country Information page for up to date recommendations. Areas at risk of transmission are dynamic and subject to change; please watch the website for updates and refer to our Country Information pages for individual up to date country vaccine recommendations. Some individual country maps are also available on the Yellow Fever Zone, provided by NaTHNaC. There may be lengthy periods between outbreaks of YF, nevertheless, in endemic areas, the virus may still be circulating, but at a level that is not picked up through surveillance. Although ongoing cases and outbreaks of YF occur in Africa and South America, the disease is preventable by vaccination and remains a very rare cause of illness in travellers. Between August 2016 and 14 March 2017 the European Centre for Disease Prevention and Control (ECDC) reported that four cases of YF had been reported in European travellers who visited YF risk regions in South America . Two YF cases, one fatal, were reported in French travellers in Peru on 10 August 2016. A third case, in a Danish traveller in Bolivia, was confirmed on 13 February 2017 . The fourth case, in a Dutch traveller in Suriname, was reported on 13 March 2017 . None of these four travellers had been vaccinated against YF . In October 2016, an unvaccinated traveller from USA was diagnosed with yellow fever after returning from the Amazon area of Peru . In January 2018, the WHO reported a case in an unvaccinated traveller from the Netherlands who had visited the State of Sao Paulo, Brazil . Since this report, a number of other cases have been reported in unvaccinated travellers from Europe, Argentina and Chile who had visited Brazil. Monitor the Brazil Country Information page for news and outbreaks for updated information. Prior to these cases, between 1970 and 2015 a total of ten YF cases were reported in unvaccinated travellers from Europe and the United States who visited South America or West Africa . There have been no confirmed YF cases reported in the UK since 1930, when a laboratory worker contracted YF while working with the virus at the Hospital for Tropical Diseases in London . Outbreak reports can be helpful when undertaking a risk assessment for travellers. However, it is important to acknowledge the limitations of such reports; case numbers and outbreaks may not accurately represent YF activity and reporting systems and the level of information that is sent to the WHO may differ between countries. The International Health Regulations (IHR) were revised and adopted by the World Health Assembly in 2005. They were formulated to help prevent the international spread of disease, and in the context of international travel, do so with minimum disruption to trade and travel . Under Annex 7 of the IHR (2005), YF has been designated as an infection for which an International Certificate of Vaccination or Prophylaxis (ICVP) may be required for travellers as a condition of entry to a country. Other diseases may be designated as above if WHO put in place temporary recommendations as a result of an outbreak being declared a Public Health Emergency of International Concern. 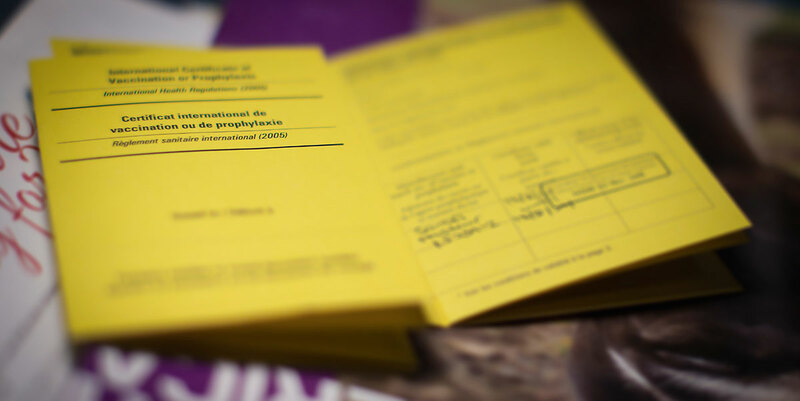 Currently YF and polio are the only diseases for which an ICVP may be required for entry into or exit from a country. As of 11 July 2016, WHO states that the period of validity of the ICVP has changed from 10 years to the duration of the life of the person vaccinated. This applies to all ICVPs for yellow fever vaccination, including certificates already issued, and new or duplicate certificates [14, 15]. Countries where YF does not occur, but where the mosquito vector and often the non-human primate hosts are present, are vulnerable to importation of YF and subsequent onward transmission within the local population. For these countries, YF vaccination may be an entry requirement for all travellers arriving from countries where there is a risk of YF transmission (often including airport transit through a country with risk of YF transmission). Countries with risk of YF transmission may or may not require proof of YF vaccination from travellers. The absence of a requirement for YF vaccination does not necessarily mean that there is no risk of YF in the country, and YF immunisation may still be recommended for the protection of the individual traveller. Member states are asked to submit details of their YF certificate requirements to WHO each year. Information is published annually by the WHO in International Travel and Health and details can be found on our Country Information pages. When YF vaccine is required under IHR (2005), failure to provide a valid ICVP to the port health authorities could result in a traveller being quarantined, put under surveillance, or denied entry . WHO states that valid certificates of vaccination presented by arriving travellers cannot be rejected on the grounds that more than ten years have passed since the date vaccination became effective as stated on the certificate; boosters or revaccination cannot be required . If YF vaccination is contraindicated for medical reasons (including infants under 6 months of age), a Medical Letter of Exemption (MLoE) from vaccination can be issued by an authorised health worker (e.g. in the UK the UKYFVC Responsible Supervising Clinician, a nurse or pharmacist working at that centre, or a licensed health professional otherwise supervising the medical care of the traveller). Jungle primates (e.g. susceptible species of monkey) and humans are the hosts for the YF virus . The virus is transmitted via the bite of infected Aedes spp. (Africa and Americas) or Haemogogus spp. and Sabethes spp. (Central and South America only) mosquitoes. Only females of these mosquito species transmit the virus. Jungle: occurring in tropical rainforests of Africa and South America. The transmission cycle occurs between monkeys and jungle breeding mosquitoes. Humans can become infected when they live or work in areas where this cycle occurs. Savannah (Africa only): occurs in the moist savannah regions of Africa where humans live and work close to the monkey population. The transmission cycle occurs between monkeys and humans, with spread via Aedes spp. Urban: following infection during the jungle cycle, infected humans can introduce the virus to urban areas where there is a high population density. Virus transmission occurs between humans in areas where the domesticated mosquito vector, Aedes aegypti (i.e. those that breed around human habitation) is present. Aedes spp. mosquitoes are adapted to living in an urban (domestic) environment and breed in water collections provided by humans (e.g. vases, tyres and other receptacles); this species is active during daylight hours, and bite from dawn to dusk. Haemagogous spp. and Sabethes spp. mosquitoes live in the forest canopy in Central and South America. These mosquitoes feed on monkeys; it is unclear if these mosquitoes have a predictable, preferred feeding time [CDC personal communication]. They can descend to ground level when the forest has been disturbed (e.g. during logging or during cultivation), where they may bite humans . Once infected with the virus, the mosquito remains infectious for life (two to three months). Generally, mosquito species are most active at times of high rainfall, both in the jungle and urban environments. YF virus can survive very dry conditions in mosquito eggs, which hatch once a water collection is replenished. This can result in YF outbreaks in urban and rural areas, even during the drier months. YF varies in severity. The infection has an incubation period (time from infected mosquito feeding and symptoms developing) of three to six days. Initial symptoms include myalgia (muscle pain), pyrexia (high temperature), headache, anorexia (lack of appetite), nausea, and vomiting. In many patients there will be improvement in symptoms and gradual recovery three to four days after the onset of symptoms. Within 24 hours of an apparent recovery, 15 to 25 percent of patients progress to a more serious illness. This takes the form of an acute haemorrhagic fever, in which there may be bleeding from the mouth, eyes, ears, and stomach, pronounced jaundice (yellowing of the skin, from which the disease gets its name), and renal (kidney) damage. The patient develops shock and there is deterioration of major organ function; 20 to 50 percent of patients who develop this form of the disease do not survive . Infection results in lifelong immunity in those who recover. The preliminary diagnosis of YF is based on the patient’s clinical features, location and dates of travel, and activities . If a clinician suspects YF in a returned traveller, an urgent referral to an infectious disease/tropical disease clinical team is required. Public Health England (PHE) Rare and Imported Pathogens laboratory is a specialist centre for health professionals providing advice and diagnosis of a wide range of unusual viral and bacterial infections including yellow fever. There are two methods to prevent YF: mosquito control and bite avoidance, and vaccination. A highly effective live, attenuated (weakened) YF vaccine has been available for more than 70 years . In general, vaccination is recommended for all persons visiting countries where there is a risk of YF virus transmission. Persons who travel to YF risk countries, without the benefit of vaccination should be advised of the risk of contracting YF and the potential for quarantine at the port of entry, depending on the country requirements for vaccination. They should also practise meticulous mosquito bite avoidance. The recommendations for YF vaccination should be reviewed on our Country Information pages. Vaccine recommendation maps can be used alongside the country information page recommendations. A careful assessment that balances the risk of disease with requirements for vaccination, taking into account the age and health status of traveller, needs to be performed prior to vaccination. There is currently one licensed YF vaccine in the UK, Stamaril® (Sanofi Pasteur). This contains an attenuated 17D strain of YF virus and protects against all strains of YF. The Summary of Product Characteristics (SPC) for the vaccine should be consulted for specific information relating to the product. *Reinforcing immunisation (booster dose) should be offered to a small subset of travellers who may be at continued risk see Public Health England guidance . Around 90 percent of YF vaccine recipients achieve protective levels of neutralizing antibody within 10 days following primary vaccination . *To date there is no evidence of increased risk of yellow fever vaccine–associated serious adverse events in people who have undergone incidental surgical removal of their thymus (e.g. during cardiac surgery) or have had indirect radiation therapy in the distant past. People who had incidental removal of their thymus after the age of one year may therefore receive a yellow fever vaccine following a detailed risk assessment. A cautious approach is recommended for those who had incidental removal of their thymus before the age of one year. In these cases further advice should be sought. For those with a febrile illness (fever) or who are acutely unwell, YF vaccination should be postponed until full recovery. Individual risk assessment should take into account the risk of the disease at the destination versus the potential for adverse events following YF vaccination (which may be greater where certain underlying medical conditions exist). Expert opinion may be advisable. Further information on precaution groups is available in Immunisation against infectious disease, Chapter Ch. 35. Yellow fever and on the Yellow Fever Zone website, provided by NaTHNaC. The 17D strain virus YF vaccine has been in use for more than 70 years. It is estimated that 500 million doses of the vaccine have been administered worldwide . Reactions to YF vaccine are usually mild and short lived. They include myalgia (muscle pain), headache, and low-grade fever, typically occurring during the first five to ten days post vaccination, and will affect 10-30% of recipients. Serious adverse events are rare and fall into three main categories: hypersensitivity reactions, vaccine-associated neurologic disease (YEL-AND) and vaccine-associated viscerotropic disease (YEL-AVD). The vaccine is propagated in chick embryos. The SPC for Stamaril® (the only YF vaccine used in the UK) lists sorbitol and lactose as excipients. Anaphylaxis, because of sensitivity to either egg or other vaccine components, is estimated to occur at an incidence of 1.3 cases/100,000 doses distributed (US data) . Post-vaccine encephalitis has been recognised as a rare event since the early use of the vaccine. Cases were reported in very young infants during the 1950s (when there was no age restriction for vaccine administration). In the 1960s, when vaccine use was restricted to babies aged over six months, reduced numbers of post vaccine encephalitis were reported . Since 2001, a new pattern of neurologic adverse events (undesirable effects on the nervous system) has been recognised [22-25]. These events have been termed YF vaccine-associated neurologic disease (YEL-AND); Reporting rates are estimated to be 0.8 cases per 100,000 doses distributed (US data) . The rates increased with increasing age (see below) . The clinical presentation of neurologic events begins two to 56 days following receipt of vaccine (US data) , with fever and headache that can progress to encephalitis (inflammation of the brain), or an autoimmune demyelinating disease (a disorder that can interrupt nerve transmission) with peripheral or central nervous involvement. Most patients will completely recover. Almost all cases have occurred in those receiving the vaccine for the first time with no underlying YF immunity . YF vaccine-associated viscerotropic disease (YEL-AVD) is a syndrome of fever and multi-organ failure that resembles severe YF disease; it was first described in 2001 ; over 100 confirmed and suspected cases have been reported worldwide . Three cases have been reported in the United Kingdom, one in 1998 and two in 2000; all the UK cases survived . One to eighteen days (median four days) following vaccination , patients with YEL-AVD develop fever, malaise, headache, and myalgia that progress to hepatitis (inflammation of the liver), hypotension (low blood pressure), and multi-organ failure. Death has occurred in more than 60 percent of reported cases worldwide . In the US, the case-fatality ratio for all reported YEL-AVD cases is approximately 46 percent . All reported cases of YEL-AVD have occurred in first-time vaccine recipients [6, 12]. YEL-AVD has been estimated to be reported in 0.3 cases per 100,000 doses distributed (US data). The rates increased with increasing age (see below) . For individuals who are aged 60 years and older, the risk for these serious adverse events increases several fold to approximately 2.2 cases per 100,000 doses distributed for YEL-AND. For YEL-AVD the risk for those who are 60 years and older is 1.2 cases per 100,000 doses distributed and higher for those who are 70 years and older (US data) . Advancing age (i.e. aged over 60 years) is, therefore a risk factor when considering YF vaccination; vaccine can be offered after careful risk assessment. Additional documented risk factors for serious adverse events following YF vaccination are thymus disorder and thymectomy following a thymus disorder; YF vaccine should never be given to individuals with this medical history [19, 27]. There is no evidence that YEL-AVD is related to the vaccine virus reverting to a more virulent form (i.e. a form able to cause disease). Rather, these patterns of serious adverse events appear to be host-related (related to the individual vaccinated). Host risk factors such as genetic control of inflammation, are being actively investigated, but it is clear that those with existing thymus disease and older adults are at more risk [27, 30]. Further information on adverse events following YF vaccine is available in Immunisation against infectious disease, Chapter Ch. 35. Yellow fever. Jentes ES, Poumerol G, Gershman MD et al. The revised global yellow fever risk map and recommendations for vaccination, 2010: consensus of the Informal WHO Working Group on Geographic Risk for Yellow Fever. Lancet Infect Dis 2011; 11(8):622-632. World Health Organization, Yellow fever- Brazil. Disease outbreak news, 22 January 2018 [Accessed February 2018]. Cook GC. Fatal yellow fever contracted at the Hospital for Tropical Diseases, London, UK, in 1930. Trans Roy Soc Trop Med Hyg 1994; 88 (6): 712-3. Young PR, Ng LFP, Hal RA et al. Arbovirus Infection Ch14. In: Farrar J, Hotez PK, Junhannss T et al (eds). Manson’s Tropical Diseases. 23rd Edn. Elsevier (Saunders). 2014. Monath T, Cetron M. Prevention of yellow fever in persons travelling to the tropics. Clin Infect Dis. 2002; 24:1369-1378. Monath TP 2001. Yellow fever: an update. Lancet Infect Dis 1: 11–20. Kitchener S. Viscerotropic and neurotropic disease following vaccination with the 17D yellow fever vaccine, ARILVAX ((R)). Vaccine 2004; 22:2103-5. Guimard T, Minjolle S, Polard E, et al. Short report: Incidence of yellow fever vaccine-associated neurotropic disease. Am J Trop Med Hyg 81:1141-3. 200913. Receveur MC, Bruyand M, Pistone T et al. Vaccination antiamarile: mise au point à propos des effets indésirables rares et graves [In French]. Médecine et Maladies Infectieuses 2009; 39(4):234-241. Barwick Eidex R, for the Yellow Fever Vaccine Safety Working Group. History of thymoma and yellow fever vaccination. Lancet 2004; 11-17; 364 (9438): 936.